Review of Frecon Farms Scrumpy cider, part of their Estate line. This is my first time trying anything from this cidery. I picked up this Pennsylvanian cider when I was in California. Note that “Scrumpy” is a term used traditionally in English cider to describe a “rough” cider from unselected apple varieties, and to “scrump” means to steal fruit from an orchard. Cider Description: True to it’s west country heritage, this batch of Scrumpy features a diverse blend of unselected cider apples from England and the US. Barrel aged, this traditional english dry style has a nice coated mouth feel with a smooth but strong finish. The apples in this blend are Dolgo Crab, Gold Rush, Kingston Black, Ashmeads Kernel, Yarlington Mill, Wickson Crab, Roxbury Russet, Winesap, Northern Spy, Golden Russet, and Golden Delicious! Grown and Harvested in 2016 in the Piedmont region of Pennsylvania. Cidery Description: We make traditional cider using classic techniques & use apples from our family orchard, which as been growing quality tree fruits since 1944. Using a blend of dessert, cider & aromatic apples, both heirloom & modern, our cider makers select the best balances to ferment into the final product. We’re proud to continue an American tradition of fine ciders that feature great aroma & flavor, recently recognized with bronze medals for the Hogshead and Crabby Granny by the Great Lakes Cider & Perry Association. First Impression: Light straw yellow hue. Very low carbonation. Smells of acidic heirloom apples, with citrus and a hint of sourness. Tasting Notes: On the sweeter side of dry. Light bodied. Low tartness. Moderate acidity. Low sourness. Hints of bitterness and tannins. No funk. Notes of sharp heirloom apple, lemon, grapefruit, mineral, and pineapple. Moderate length sour finish. Moderate flavor intensity and sessionability. Moderate to high complexity. Low to moderate apple flavor. Low overt barrel influence, but I’m guessing it smoothed out the flavor. My Opinion: I don’t like sour, so I wasn’t personally a fan of this selection. I was hoping for English style based on the description, but it was closer to farmhouse style. Every cider isn’t for everyone though, and I’m glad I got to try it. I’d recommend this to folks who like dry sour cider (farmhouse-style, rustic, wild yeast fermented, Spanish Sidra, etc). Closing Notes: A number of times now I’ve seen cider described as English-style when it isn’t really close, primarily due to the use of different apples (dessert or heirloom instead of bittersweet cider apples). At times it appears the term is used just to describe that it is dry and/or more rustic in style, and varies from the majority of U.S. cider which is sweeter and clean (no sourness or funk). This is a great example of our need for consistent terminology, which will likely just take time. Have you tried Frecon Farms cider? What did you think? 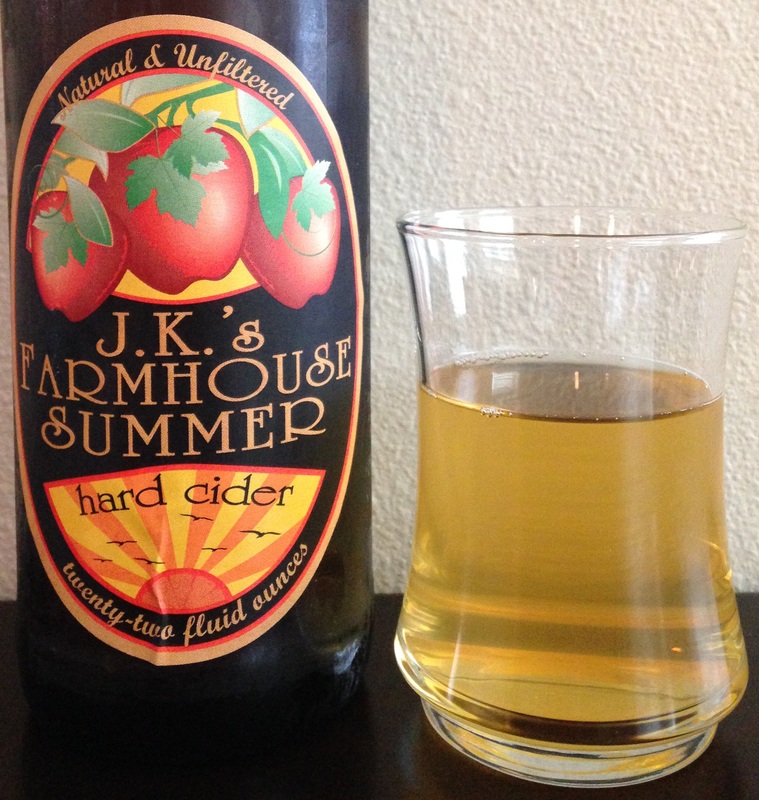 Review of Farmhouse Summer from J.K.’s Scrumpy. This is their summer seasonal offering, and like all their cider, is organic, unfiltered, preservative/sulfite free, and made only from fresh pressed juice. 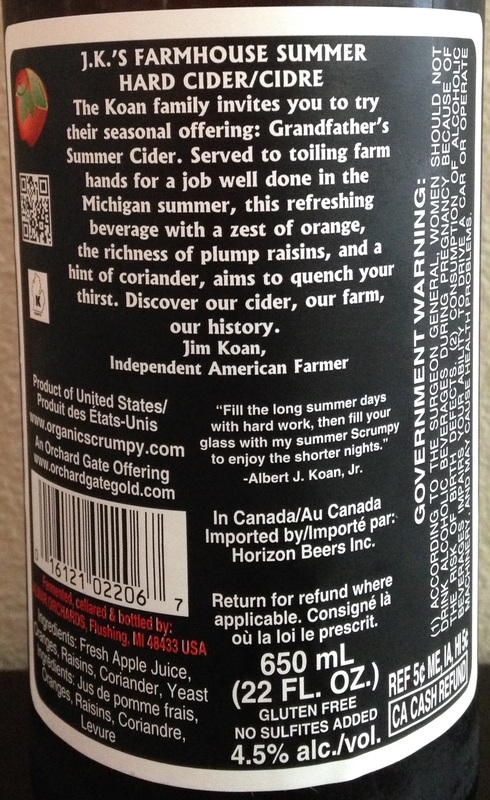 Cider Description: The Koan family invites you to try their seasonal offering: Grandfather’s Summer Cider. Served to toiling farm hands for a job well done in the Michigan summer, this refreshing beverage with a zest of orange, the richness of plump raisins, and a hint of coriander, aims to quench your thirst. Discover our cider, our farm, our history. -Jim Koan, independent American Farmer. Additional Information from J.K.’s Scrumpy: They grow 50 varieties of apples on 500 acres on their farm. In the 1970s there were 36 orchards in their area, and now, only 2! Approximately 16 of those varieties go into Farmhouse Summer, including Harrison, Spy, and Cortland. The cider is fermented for 6-16 months, then blended for consistency. Therefore no two batches are ever alike (as they say, just how Mother Nature intended). Thanks to Sabrina from J.K.’s Scrumpy for the extra info! Cidery Description: This Original Hard-Cider has been made on our family-owned farm in Flushing, Michigan for well over a hundred years. It was first pressed back in the 1850’s. Not much as changed in the process since then. We use the same apples from the same orchards as my great-great grandfather did before the time of the Civil War. We are proud of that. It gives us a sense of history. The cider has played an important role in the ongoing history of our farm. The sale of cider actually saved our farm during the Great Depression. And, during the Prohibition people came from far and wide for our “Special Farm Cider.” We grow vegetables and fruits here at Almar, but our cider has kept us in business when times have gotten tough. Regretfully, it seems that history has a habit of repeating itself…These past few years, many of our nation’s orchards have closed their barn doors and orchard gateways as the influx of apple juice made from cheap concentrates arrive in the USA from China and South America. Some call it a “sign of the times,” and others seem to appreciate the “bargain” at the grocery store. All I can say is that our Orchard Gate Gold is the real thing. It’s not a “made using” or “contains” product. IT IS REAL CIDER. Pure, natural and uniquely flavorful. We grow, harvest, and press the apples right here on the farm. It is time-consuming, labor-intensive and worth every bit of what it takes to make it. Our cider is not only natural, it is truly organic. It always has been. It’s simply a fact of what we do – and how we do it. We use no insecticides in the farm orchards. Rather, I do what my grandfather did. I have a large flock of guinea fowl that wander about and eat the bugs. Fallen apples that have hit the ground are always a food source for pests, so I let my Berkshire pigs wander the orchard and eat the fallen apples. In a fast-paced, instant gratification society all this may seem a little old fashioned, or not “cost-effective.” But, we have a cider that is not like any other, and the idea of playing around with what makes that happen… well, it just ain’t part of the plan. How Found: I had seen this variety, but had been hesitant to try it due to the orange, coriander, and raisins, which just sounded weird. However, discussion at the Hard Cider Appreciation Society on Facebook indicated these flavors weren’t too prominent, so when I saw it on sale I thought I’d give it a try. First Impression: Hazy light amber. Still. Smells like sweet ripe apples, pear, citrus, and cinnamon. Opinion: Very sweet. Orange, citrus, and honey notes. However, I didn’t taste any of the pear or spice I smelled. Apparently coriander can taste like citrus (I looked that up as its not something I’m familiar with; I also learned coriander is the seeds of the cilantro plant). No significant acidity, tartness, or bitterness. Medium bodied. Syrupy taste and texture. Quick finish, but I got an annoying lingering aftertaste/feeling at the back of my throat with this cider, almost minty? It wasn’t as prominent for my husband, but he noticed it once I mentioned it. Apparently the high degree of sweetness in their ciders is from arrested fermentation. Allowing the cider to completely ferment makes a drier cider (as the yeast has fermented most/all of the sugar to alcohol). This is why cidermakers often back sweeten their ciders with unfermented juice (plus that is a way to bring the ABV down to a target level). By arresting the fermentation process they retain more sweetness. Scrumpy usually refers to cider made from “scrumped” apples (which is either defined as those stolen from the ground or those which are old & shriveled up) in the West Country of England, which can be a potent and rough style of cider. I’ve had one true Scrumpy cider, Serious Scrump from 2 Towns, and it wasn’t for me. However, currently this term is instead used to indicate that a cider is a craft / artisan product. Almost all commercial ciders use sulfites (sulphur dioxide) as a preservative. Avoiding their use is more difficult as sulfites are used to kill the natural yeast on the apples. The use of sulfites makes a more standardized product and reduces the risk of spoilage. Pasteurization can instead be used. Some folks are sensitive to sulfites, so its good to see that folks have the option of cider without them (although a small amount can be naturally occurring from the fermentation process). Most Similar to: Other ciders from J.K.’s Scrumpy, which have a unique sweet farmhouse (unfiltered) taste. Closing Notes: I really support all their practices at J.K.’s Scrumpy / Almar Orchards (organic, no preservatives, etc), but I didn’t care for this cider. Its amazing how low they can keep their price point while maintaining all those practices. However, I really like their Northern Neighbor cider, which is made from Michigan and Canadian Saskatoon apples. I’ve also tried their flagship Orchard Gate Gold, but not their Winterruption (winter seasonal) or Pair Perry. They will have Pair Perry at Cider Summit Seattle, so I look forward to trying that one! J.K.’s Scrumpy ciders are great for folks who like a sweet cider but want a craft product (affordable and semi widely available too). 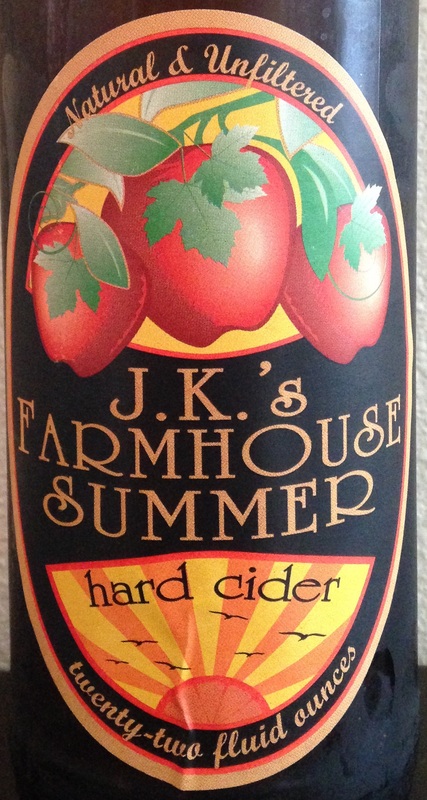 Have you tried J.K.’s Scrumpy Farmhouse Summer? What did you think?